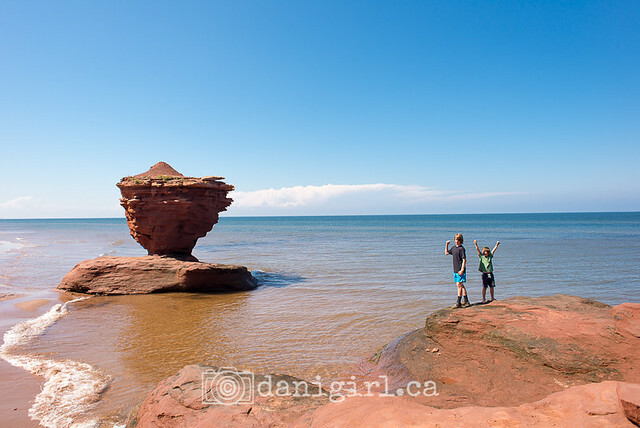 Although we’d had a loose idea of what we planned to do pretty much every day of our epic PEI trip, we awoke the morning of the final day with no clear plan. We chatted as a family to make sure we’d done just about everything we’d wanted to do, and discussed how we wanted to invest our last precious hours. The forecast was rather grim, with grey skies and thunderstorms pending in the afternoon. The boys wanted to visit a Cows store for ice cream and souvenir t-shirts, and I wanted MOAR BEACH. The choice was clear: Cavendish! The boys got their t-shirts and stuffies and browsed the kitschy shops on the boardwalk, and I looked speculatively at the heavy grey clouds, which seemed to want to disappate. 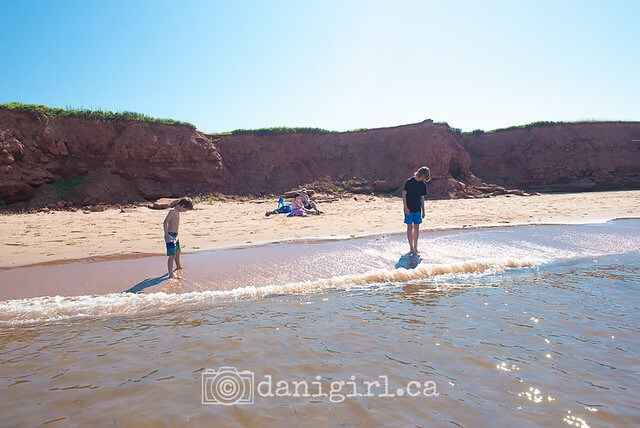 We debated various beach options: Cavendish is right there, and we had not yet visited it on this year’s trip. Basin Head, our hands-down favourite, was a good hour and a half away. Brackley? Greenwich? Nope. As occasional peeks of sun broke through the clouds, I checked the tide tables. 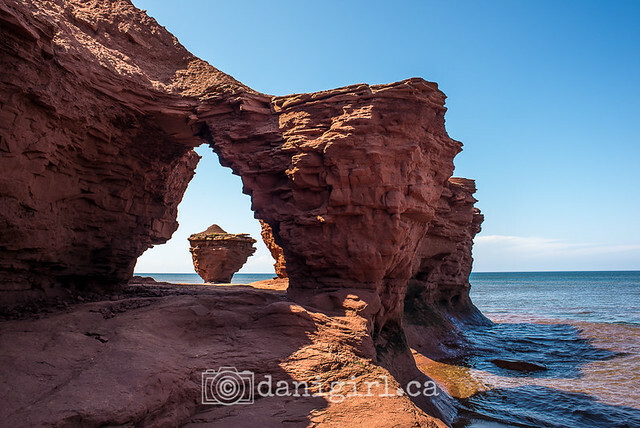 If we leave RIGHT NOW, we should arrive at Thunder Cove well before the tide climbs high enough to cut us off from the arch and teacup yet again. As we drove, the peeks of sunlight grew in intensity, the clouds thinned, and by the time we pulled off on Thunder Cove Road, the forecasted thunderstorms had given way to unexpectedly sunny skies. Beloved and Simon found a comfy spot to park our blanket and sandcastle building tools, while Tristan led Lucas and me down the beach the 800m or so toward the rock formations. As we got closer, I began to suspect that we were to be thwarted yet again. The waves, considerably calmer than our last visit, were nevertheless lapping gently at the foot of the cliff we had scaled. Tristan had already scurried up and over the rocks when Lucas and I arrived, and I tried to convince Lucas to walk through the seaweed-choked water to go around the rocks that we couldn’t climb over last time. Lucas took one look at the seaweedy waves and abjectly refused. I couldn’t say that I particularly blamed him, but there was no way that I was going to have come all this way not once but twice and be kept from the rock formations yet again. I’d even checked the tide tables! I was unsuccessfully trying to convince him to hop on my back for a piggy-back ride, and simultaneously trying to discern whether there were any jellyfish or sharks or killer whales hiding in the seaweed-tossed waves, when Tristan called to us from a ledge above. Right. A Tristan path and a mom path are not the same. Mom paths are wide, have directional markers, and are maintained by the province. Tristan paths have scree, toe-holds and vertical drops. Regardless, turning back was not an option (oh you stubborn woman!) and the waterward option was less than palatable. Up we went to inspect Tristan’s path. 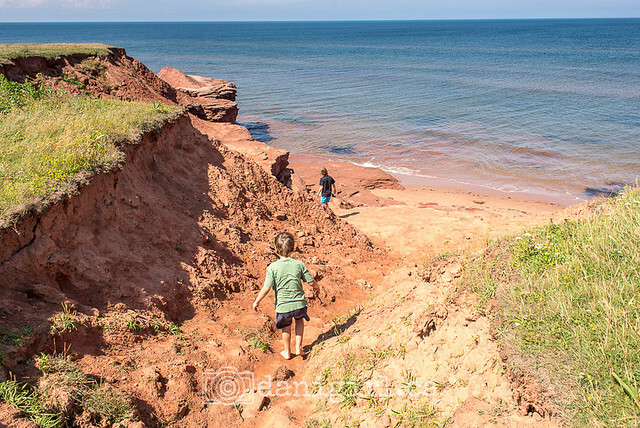 We started off where we ended our adventure last time, on a ledge that wraps around the edge of the cliff but becomes narrow, scree-filled and entirely inappropriate for seven year olds and those on the eve of their 46th birthday. Oh good, higher is the direction I wanted to go. Not. But up we went, and to his credit there was a path, an actual path for humans and not just billy-goat kids, through the marran grass. What goes up must come down. Tristan skipped down, Lucas scootched down, and I eased down, one tentative, baretoed step at a time. Tristan coached me on each step. We made it to, and through, the arch, and on to the teacup. My trophy photo. In two weeks of grey skies, I love that we a beautiful blue backdrop for this one! And then, back up and over we went, some of us more quickly than (ahem) others. For Tristan, the final descent back to the beach was as easy as one big leap. Then he climbed halfway back up to hold my camera for me while I scootched and slid and picked my way down one careful step at a time. Lucas was half way down the beach by the time I got down. And look at that sky, that cloudless perfect blue sky. 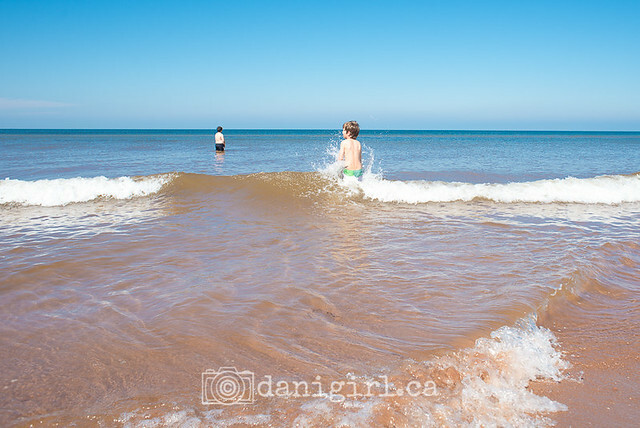 One could weep for all those grey cool days, but instead, we celebrated the sun by playing in the waves. And so the tide begins to turn on my relationship with Tristan. 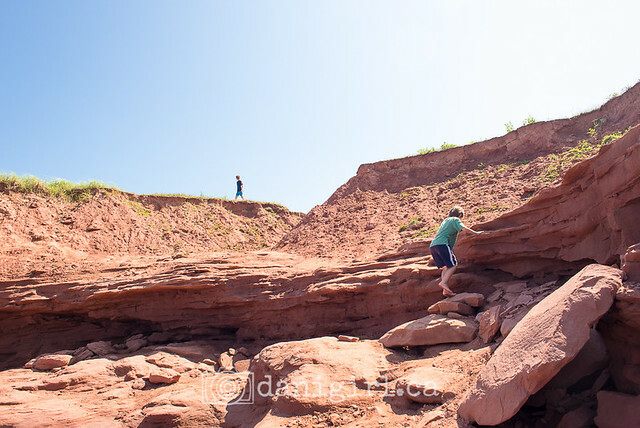 I never would have made it up and over those sandstone cliffs if he hadn’t been there. It was partly sheer stubbornness (if he can do it, I can do it!) and partly his genuine conviction that of course we could get over the other side that motivated me. I see a sea change here, and I’m not sure if I’m ready for it. But at the same time, I wouldn’t trade it for the world. 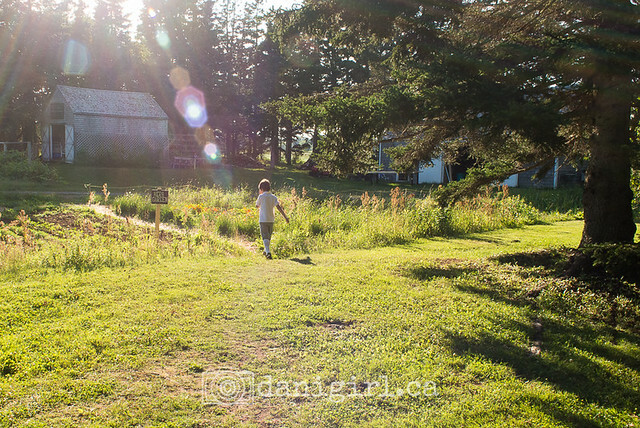 Is there anything better than an adventure and exploring on a sunny summer day? Of course there is – when you share it with a friend! 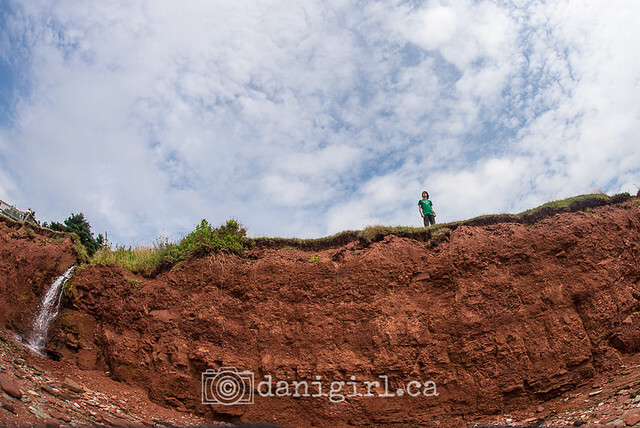 A ceilidh, pronounced “kay-lee”, is part dance, part social gathering, part kitchen party, and PEI takes its ceilidhs seriously. 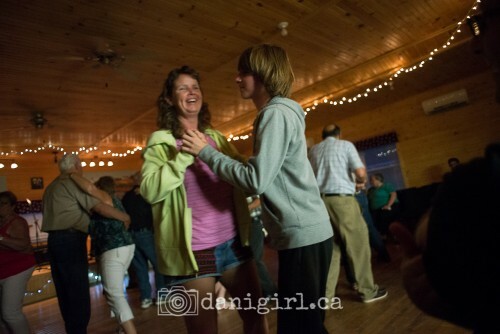 On any given night during the tourist season, you can choose from up to seven or eight different ceilidhs on different parts the Island. 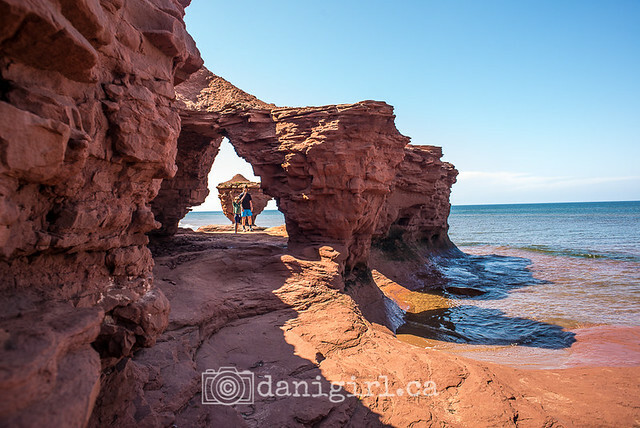 Being part Scottish myself, and loving east coast music, attending a ceilidh was high on my list of things I wanted to do during our time on PEI. I was expecting an evening of sing-along Irish folk music, maybe a little Stan Rogers, a sea shanty or two, some fiddle music and a grand call of “Sociable!” In other words, what we’d come to love at a night out at a pub like the Heart and Crown. Maybe there are ceilidhs like that on the Island, but the one we stumbled into was an entirely different kettle of lobster. While I’d understood them to be family affairs, I asked anyway at the table set up at the entrance whether kids were welcome. The lovely white-haired ladies at the table clucked and cooed over the boys and said there would be no charge for Simon nor Lucas, but they did charge the adult’s admission fee of $4 for tall Tristan. We entered the darkened hall and I had my first inkling that maybe this wasn’t the show for tourists that I had anticipated. We had arrived just as the musicians were getting ready to play, and the hall was full enough that we had trouble finding folding chairs enough for all of us. I could spot maybe two other obvious tourist families (the hoodies and shorts were a dead giveaway), and the rest of the hall appeared to be filled with locals, not a one of them younger than 65. As we sat and waited for the music to start, discussions flowed around us about who was spotted speaking to whom and whose house needed a little paint on the porch and who was looking a little tired tonight and oh my goodness but did you see Debbie wearing that red blouse, she knows she can’t pull off red, what in tarnation was she thinking? And then the music started. Well, it was mostly music. The fiddle made occasional and unfortunate screeches of a most unmusical nature. I like to think I have a fairly broad, if not eclectic, knowledge of many genres of music, but there was not a single song that I recognized. I can assure you that they were not something that Alan Doyle will be covering on Great Big Sea’s next album, of that I am sure. The best approximation I could offer would be early Pasty Cline mixed with the very whiniest type of “my tractor’s got a flat and my dog died and my wife ran off with my uncle Joe” western twang. After a few songs, new musicians would take the stage and clearly the evening was part dance and part talent show, 50 years after grade school ended. And didn’t the dance floor just fill up with all those grey-haired locals? 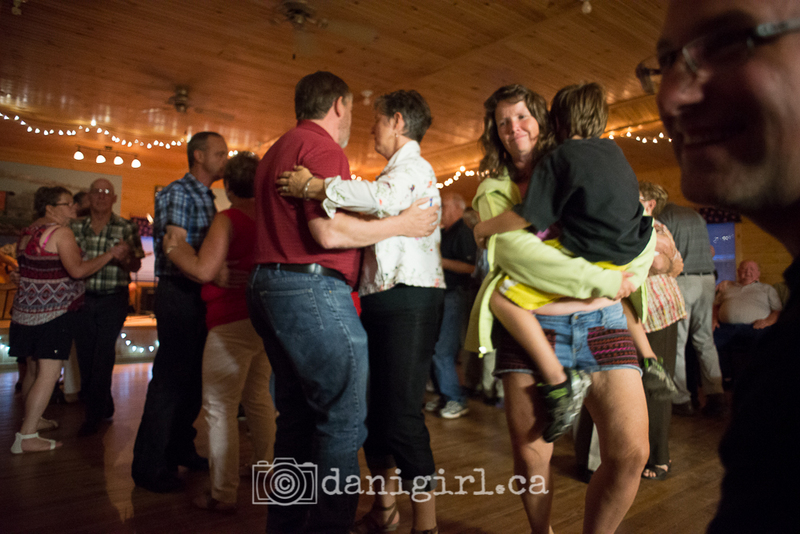 Couples danced, women without menfolk danced with each other, and each song they switched partners. Beloved nailed it when he called it a box social at the senior’s home. It was equal parts weird and delightful, and I couldn’t help smiling at how much everyone seemed to be enjoying themselves. Everyone except the boys, that is. While I can certainly appreciate the joy of the dancers on their social outing of the week, you can surely appreciate the torture that the evening wrought on their teenage souls. To their credit, they clapped politely after each song, but I could see plainly on their faces that they’d rather be trapped in the car through endless hours of New Brunswick highway than endure two hours of sitting through this. That’s the point at which I leaned over, laughing, and whispered in Beloved’s ear, “Okay, so maybe not ALL my ideas are good ones.” I think Lucas was actively sliding off his chair onto the floor as I said it. I should mention here that I have serious dance anxiety. I have never enjoyed dancing. I’m naturally clumsy, and have no sense of rhythm whatsoever, and while I am incapable of ceding the lead to my partner I am not a strong enough dancer to lead. Beloved, on the other hand, is a wonderful dancer, which makes me feel even more clumsy and wooden and anxious. Watching the dancing couples filled me with joy, though, and I knew it was up to me to make the best of what I already thought was a rather delightful memory in the making. I asked Beloved to dance, and I managed not to break any of his toes in the process. More importantly, though, the boys watched us with interest. Another song passed, and when I asked Tristan if he would like to dance, he blushed and hesitated long enough that Simon jumped in for his opportunity. And then this happened. And then Simon wanted to dance again, and Lucas wanted to dance again, and the other families were dancing, and some of the local men asked the young daughters of the tourist families to dance, and it was the sweetest, most charming evening. There was one fellow in particular who looked alarmingly like Mike Duffy to me, and he was having the time of his life. He jigged and stepped and kept his handkerchief in his pants pocket to wipe the sweat pouring from his bald brow as he danced with every lady in the room. He was adorable, and I harboured a deep fear that he’d make is way around to asking me to dance by the time the night was through – thankfully, for the sake of his toes and mine, he did not. Just as we were getting ready to leave, the floor cleared for a square dance of sorts. It was really a bit of a disaster of couples, and every turn seemed to leave someone standing awkwardly out of place, and people bumped into each other and there were really only two or three folks who seemed to have any idea of their way through the chaos. One fellow in particular, I’m going to conservatively put him at 80 years old, seemed to know what he was doing and I so enjoyed watching him that when we happened to bump into him on our way out, I had to let him know how much I enjoyed watching him dance. His brogue was so thick that I could make out only about half of what he said, but the gist of it was, “I used to teach square dancing but there’s only so much one man can do. I can’t teach the whole bloody floor!” The disgust in his voice was priceless and worth the price of admission alone. As we made our way out, several of the locals stopped us to wish us a good evening, or to tell us to stay. “We’re about to put out the lunch, you can’t leave now!” Lunch, at 9:30 pm, was being laid out as we left, and of course it comprised sandwiches on white bread, cut into triangles. While we didn’t stay for lunch, we were charmed by the kind words from the locals, complimenting the boys on the dancing and speaking to us as if we showed up every week and would be back the next week for more. So while not all my ideas are good ones, some of them turn out for the best despite my intentions. 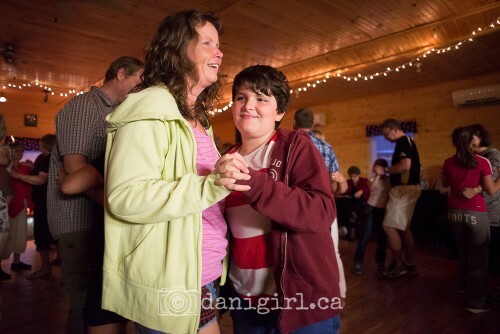 Our ceilidh adventure was nothing close to what I’d expected, but I’m willing to bet the boys will never forget it. 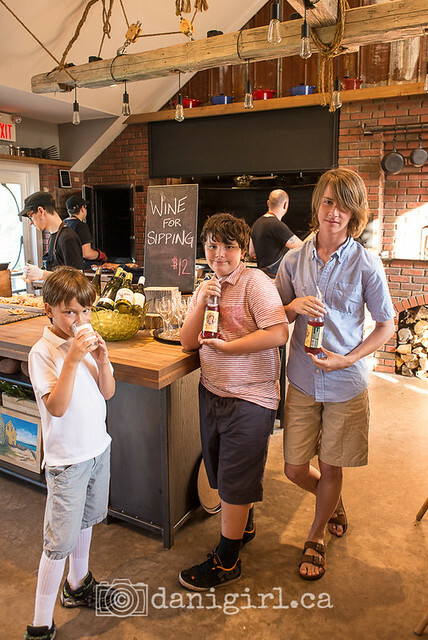 Three rowdy boys, one fine dining experience – what could possibly go wrong? Absolutely nothing, in fact. Everything was perfect! You might have heard that earlier this summer, my culinary hero Chef Michael Smith announced that he and his wife Chastity had purchased the Inn at Bay Fortune, the very same place that had launched Chef Michael’s television career back in the 90s when he was The Inn Chef. 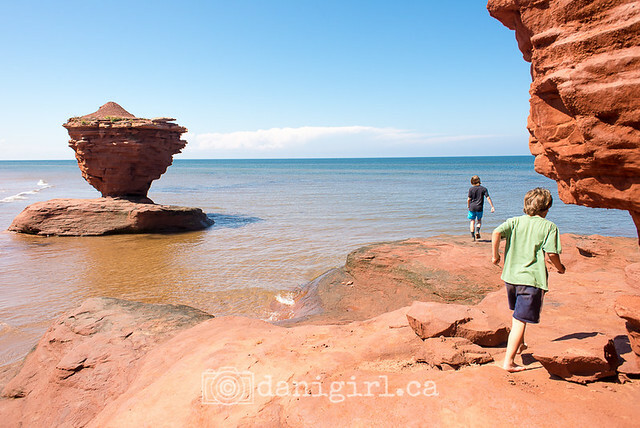 For weeks leading up to our trip, I agonized about making reservations: I dearly wanted to go, but I couldn’t quite get comfortable with the idea of leaving the boys on their own in a strange place for several hours while we were a 30 minute drive away. I also had a bit of trouble wrapping my brain around a $500 meal. When I found out that kids could join the “FireWorks” feast (everything is cooked over open flame in a stone oven) for half of the adult price, I couldn’t resist and asked Beloved if we could make reservations to celebrate my birthday. 1. What to wear. Not so much for me – I have lots of pretty summer dresses perfect for a semi-formal dinner out. But the boys don’t have any pretty summer dresses, nor do they fit into mine. I managed to scrounge up some shirts with collars and no (obvious) stains or tears, although I did not realize until it was too late that I’d packed Lucas’s soccer socks instead of more moderate length sport socks. 2. Whether the boys would eat the food. I wasn’t as worried about this as I was about the clothes. More than half the meals we eat come from a Chef Michael cookbook, and his family tastes seem to align perfectly with our own. But still, I worried. Seven year olds have notably capricious palates. 3. Whether we’d make it through four hours and seven courses of food. When you are comprised largely of wiggle, four hours is an excruciatingly long time to sit at a table for dinner, especially when it runs two hours past your bedtime and you’ve been playing in the sun and sand all day. And I was a little worried about the boys’ behaviour as well. 4. The cost. The final bill was well over $400, which is a breathtaking amount of money for a meal in our world. However, it is on par with some of the other Island Experiences we’d considered like renting kayaks and canoes or deep sea fishing. One lucrative photo contract came through just before we left and helped pay the way, but the Scottish-Dutch DNA in my genes harangued me for even considering such an exorbitant meal. 5. That we would, and that we would not, actually meet Chef Michael himself. Of course, it would have been absolutely amazing if we did. 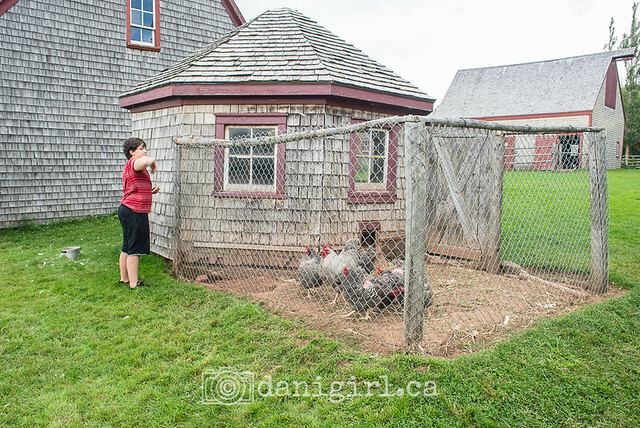 We cook from his cookbooks, we watch his TV shows, and our favourite family photo hanging over our dining room table is a picture taken at his FlavourShack in PEI last summer. To say he is a major celebrity in our lives is a bit of an understatement. I think an IRL meeting with perhaps only Steve from Minecraft or Link from Zelda would make more of an impression on the boys. So I was worried that they would be disappointed if we did not actually get to meet the man himself, but also a bit nervous that we actually might, because (whispers) I have a bit of a crush on him. As usual, I needn’t have worried about any of it. The boys were nothing short of amazing. They’re drinking Anne’s raspberry cordial, of course! Lucas loved that he could help himself. 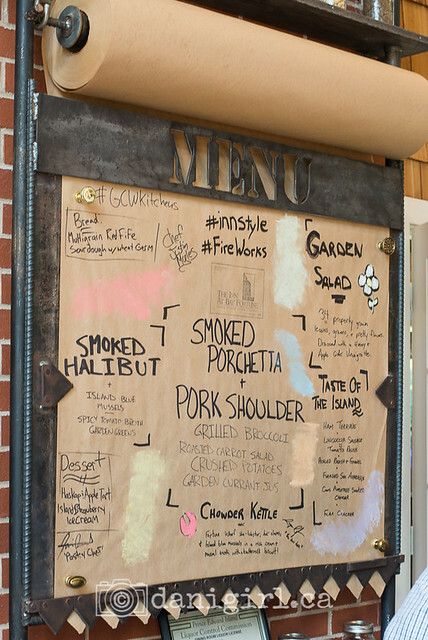 When I saw the menu, I heaved a massive sigh of relief knowing they’d eat almost everything that was being served. Simon was most excited about the 36-item house salad, but it was the seafood chowder and smoked halibut that had me drooling. A more formal layout of the evening’s courses. 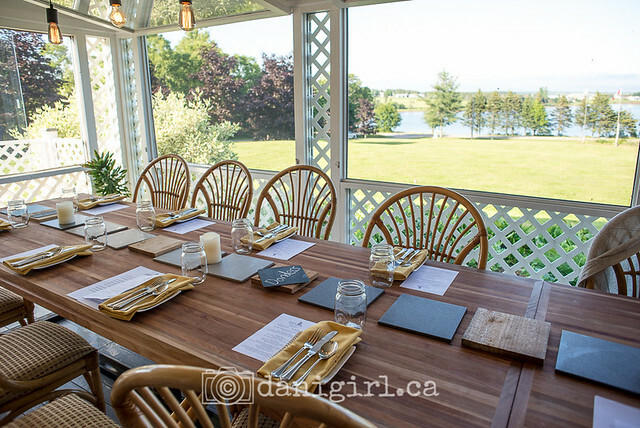 I can’t think of a more lovely setting for a birthday dinner – and note the personalized chalkboard trivet in the middle! We started the evening with oysters in the actual kitchen where the Inn Chef was filmed. None of us had ever tried them before, and to be honest I probably would not have tried them under other circumstances. But heck, when on the Island, do as the Islanders do, right? To my delight, they were delicious, especially with a little signature Bloody Mary ice on them. And to my even greater delight, Lucas was willing to try them as well. He prefered the brine over the actual oyster, though. The whole evening was a surprisingly family-friendly affair. We were welcome to inspect the grounds and gardens, which we did. I also spent most of the meal re-imagining my dinnerware back home. Much as I love my reclaimed barn wood dining table, I think we need to trade it in for a butcher block table like the massive one we dined on. And we need more mason jars – both for drinking and for soup. 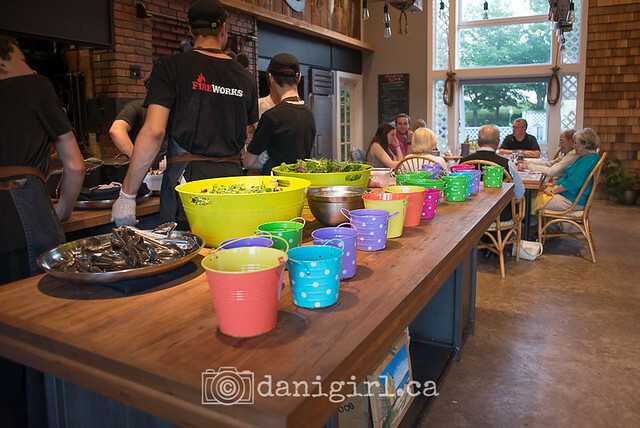 And how amazing are these colourful pails – that’s the salad course! As well behaved as the boys were, and they were in fact so well behaved that three separate servers complimented their behaviour and their manners, I am supremely grateful for the gift of the two women who were by chance seated beside us. We were wedged in between two parties, in fact, and when the boys saw the long table and realized they would be sitting beside strangers, they scrambled for the safe “inside” seat. 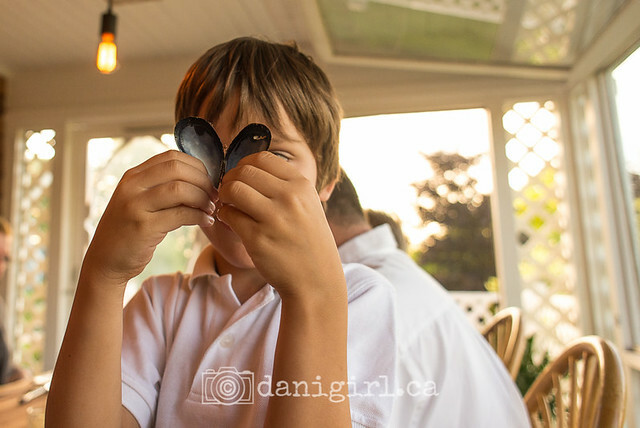 One large party seemed to be comprised of an extended family of Islanders come home from across the country to have dinner together, and they were loud and cackled with laughter and turned their chairs inward toward their group and away from us. On the other side of us were a woman and her mother, and by the end of the evening I wanted to go home with them. I can only imagine how some people might react to arriving at an expensive fine meal to find themselves sharing space with three young boys, but this lady sat down beside Simon, smiled a massive smile and said, “Hi, I’m Sheila and this is my mom. What’s your name?” Turns out Sheila grew up on PEI and her mother still lives in Georgetown, and they were two of the nicest people we have ever met. 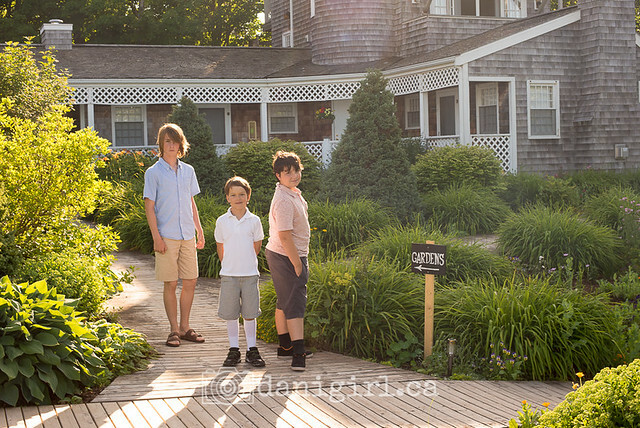 They regaled us with stories about growing up on the Island, shared insider secrets about locations for beaches and cottages and where to find wild sea asparagus, ribbed Beloved for not letting the boys jump off the bridge at Basin Head, and generally treated us like family. I truly thought the mother was going to ask to adopt Beloved – she was sitting at an angle where I couldn’t quite hear what she was saying most of the time, but her laughter rang out like a bell as she laughed loudly at each and every one of Beloved’s jokes and quips. When the evening drew long between the main course and dessert and the boys began to get silly, Sheila took one of the markers I had pulled out for the boys and showed them puzzles and mazes. They truly made the meal a memorable and delightful occasion for us, and I am forever grateful for their kindness. So in the end, we did not get to meet Chef Himself at our dinner out. We did, however, eat the most amazing meal of our lives. There was so much food we could barely move by the time it ended. I was incredibly proud of my boys, who gamely tried a little bit of everything and embraced more than a few new tastes. A visit from “the world’s tallest freestanding chef” would have been the icing on an already delicious birthday cake, but meeting sweet Sheila and her charming mother made up for his absence. 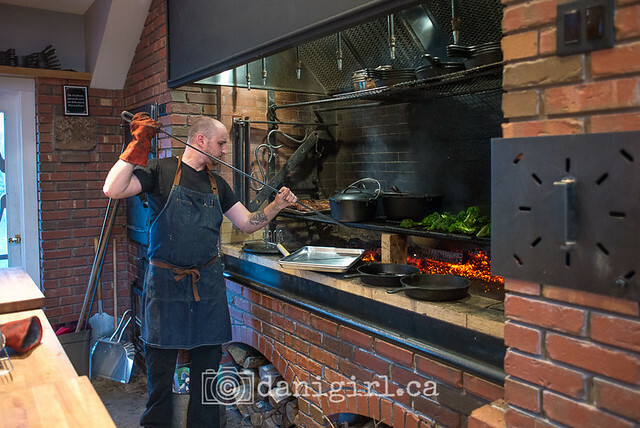 I’ll leave it to people who write about food for a living to offer a more serious critique of the menu, but I can tell you this much: we loved it, and it’s an experience none of us will forget. 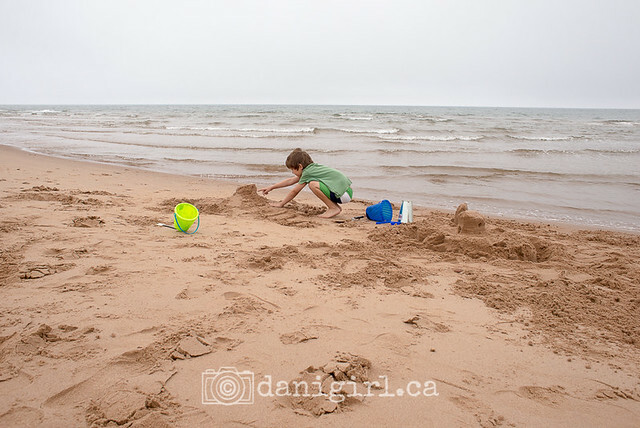 Since our sandcastle building workshop on the weekend, Lucas has been asking for the tools and the time to go back to the beach and put his skills to work. 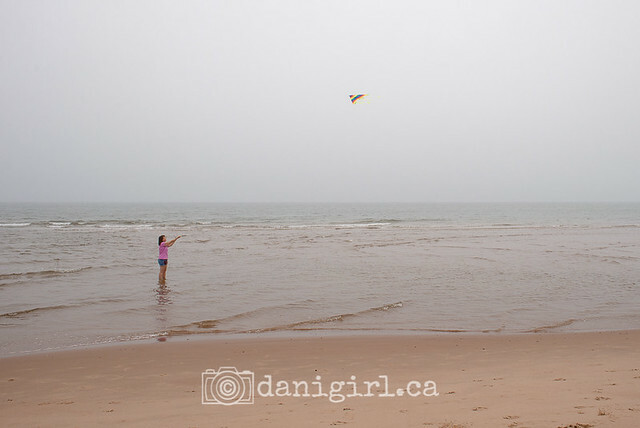 Despite the fact that the weather forecast said no precipitation for the next three hours, once again we arrived at the beach to drizzle that wavered into rain and back into drizzle for most of the morning. We threw up our hands and said, “Screw it, let’s do it anyway.” Well, I might have used a different term than screw it. I may be just a leeeeeetle bit fed up with the weather. Twelve straight days with rain will do that to you! 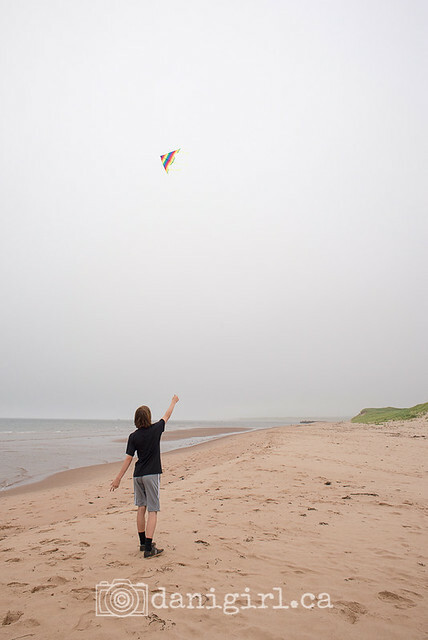 I’d been dragging my fancy dollar store kite all over PEI, but I finally pulled it out of the package. I kept a watchful eye out for lightning! I even shared it with the boys! Lucas was happy to get back to the beach and start building. The rest of the family played in the sand, too. After a couple of hours, we were thoroughly damp and chilled. It strikes me as more than a little ironic that the folks back home are experiencing record-breaking heat, and we can’t quite make it to 20C. The air and water were both about 17C here. Brrrr! Beloved and I have a special affection for pioneer villages. 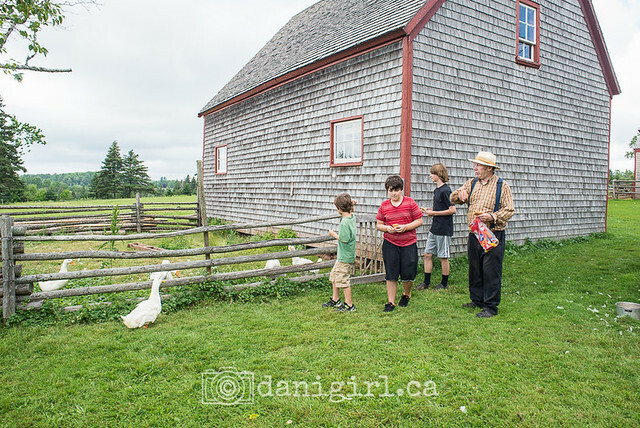 We visit Upper Canada village each year, and of course we love the Cumberland Museum. In fact, we were married in the Fanshawe Pioneer Village in London. 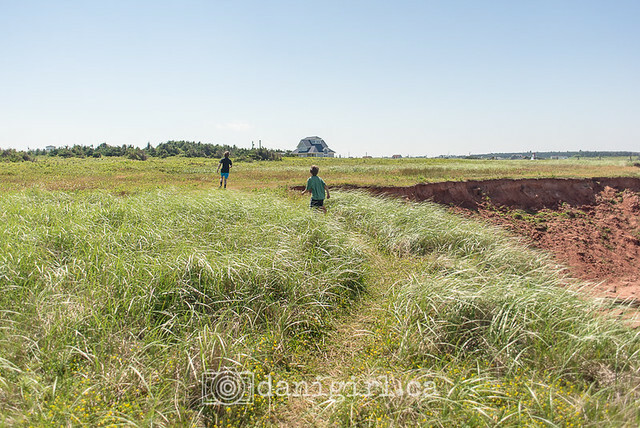 So, a visit to Orwell Corners in PEI seemed like something we simply had to do. And as we drove over the Island toward Orwell Corner, the clouds started to break once again, showing hints of blue sky and sunshine. 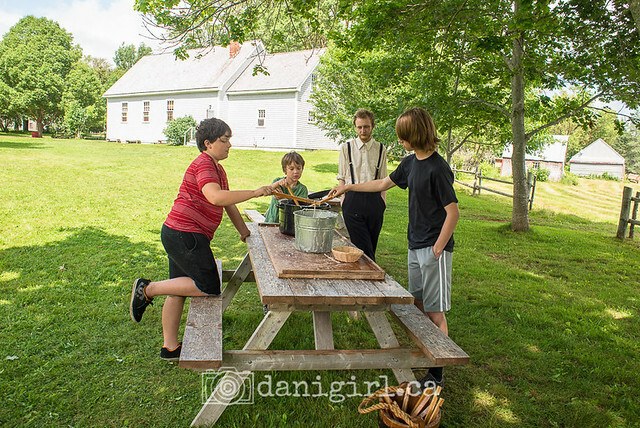 Orwell Corner is an historical museum in the Points East Coastal Drive area of the Island, a fully preserved agricultural village settled in the late 1850s and restored to that time period. It fascinates me that each building rests exactly were it was built, and has not been moved and resettled like Upper Canada Village. Interpreters dressed in period costume chat with visitors, offering insight into village life. 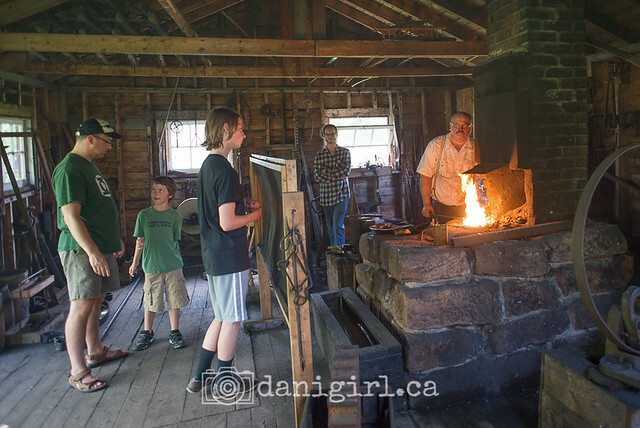 We particularly liked the blacksmith, perhaps because not so long ago Tristan said he would like to be a blacksmith when he grew up. 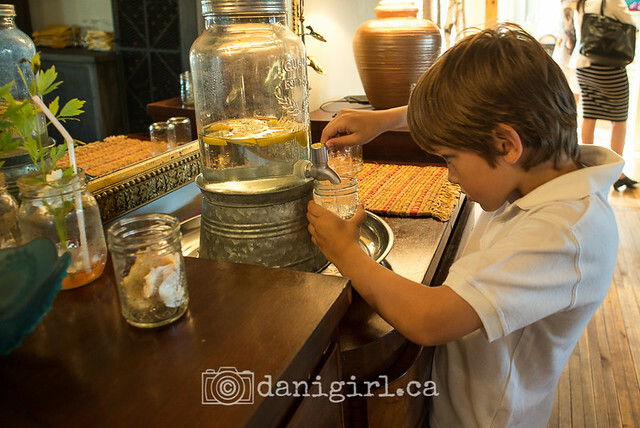 Then we made candles by dipping a wick in alternating buckets of hot melted wax and cold water. The boys said they will save their candles and use them on their next birthday cakes. My favourite part, though, was the barn. We were poking around the animal stalls when the farmer asked if anyone wanted to feed the chickens. YES! Me, me, pick me!! We fed the geese, too. 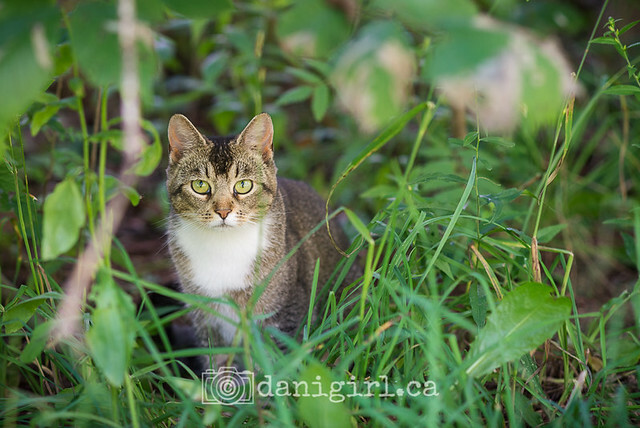 And one of the barn cats came out to steal whatever he could catch. 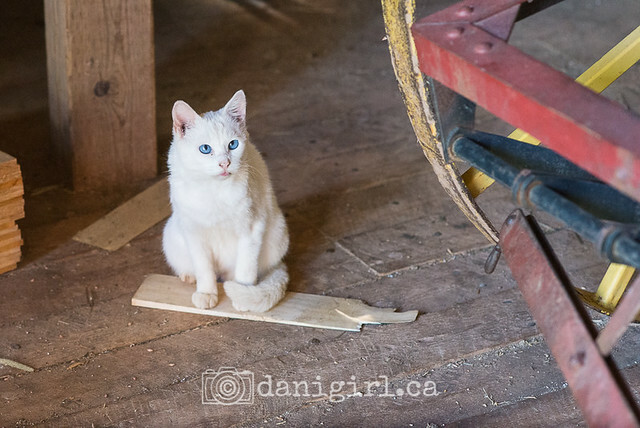 We were charmed by the barn cats! 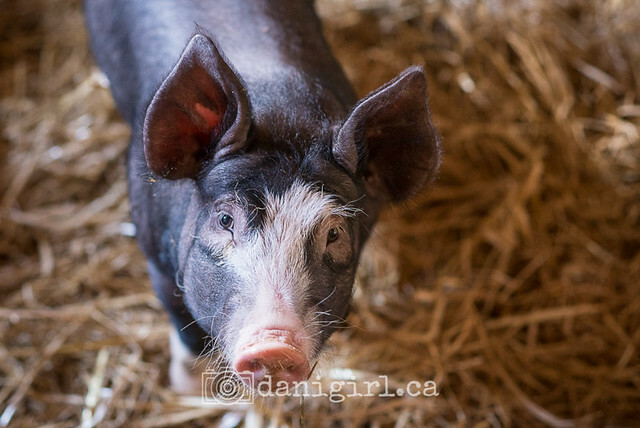 Although I liked the sheep and friendly piggies, too. 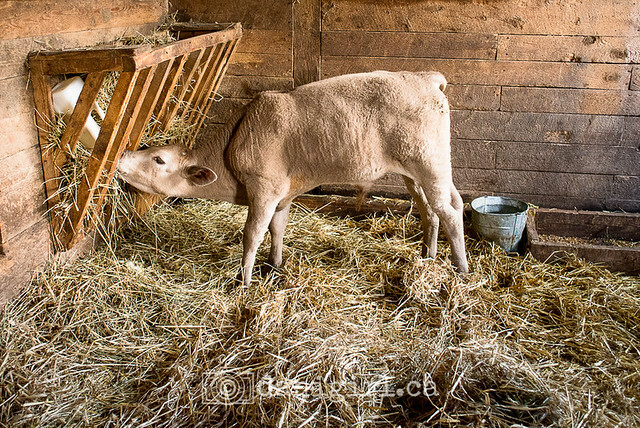 It was also feeding time for the calf. I swear, I will never be able to ramp back up to city time after spending two weeks learning how to live the laid-back pace on the Island. We spent two hours poking around the dozen or so buildings in the village and chatting with the interpreters. 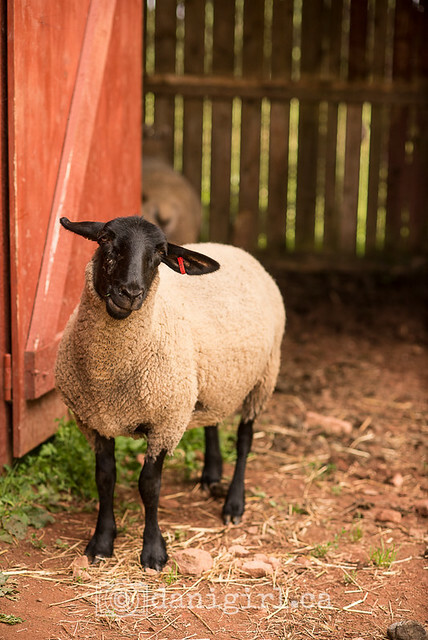 It was small enough that the boys could explore at their own pace, and they spent half the time trying to coax various barn cats to come closer – there were no takers. I think they miss Willie! Orwell Corner is a lovely place to pass a lazy summer afternoon, and you’ll learn something in the process. That’s a definite win in my books! 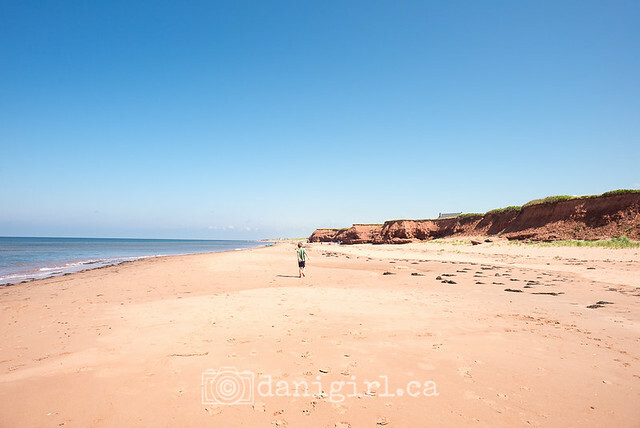 One of the things that most amazes me about the beaches on PEI is not the sheer abundance of them, nor their beauty (both of which are, indeed, amazing) but the vast differences in the character of various beaches. 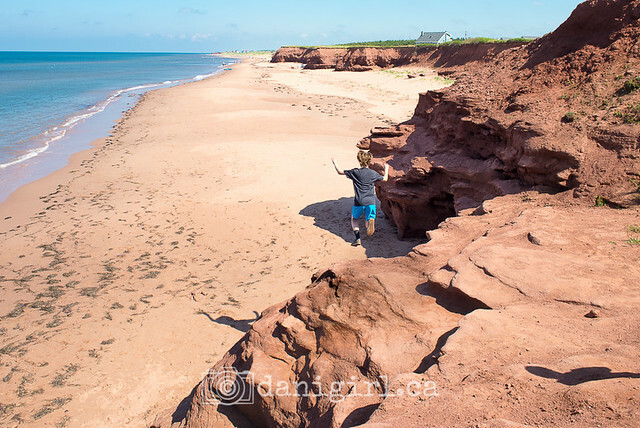 Each one we’ve attended (Brackley, Basin Head, Thunder Cove, St Peter’s Harbour, Covehead Harbour, Greenwich, and now Argyle Shore) has had its own personality. 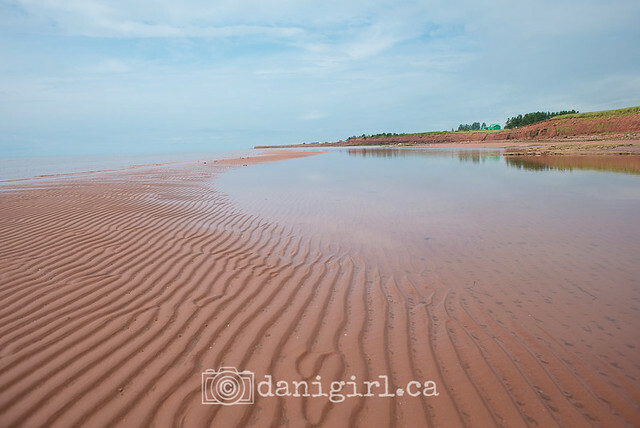 The first six are all on the north shore, known for wilder seas with waves and steep drop offs, but the southern shore is known for a far more gradual slope and its distinctive red sands. 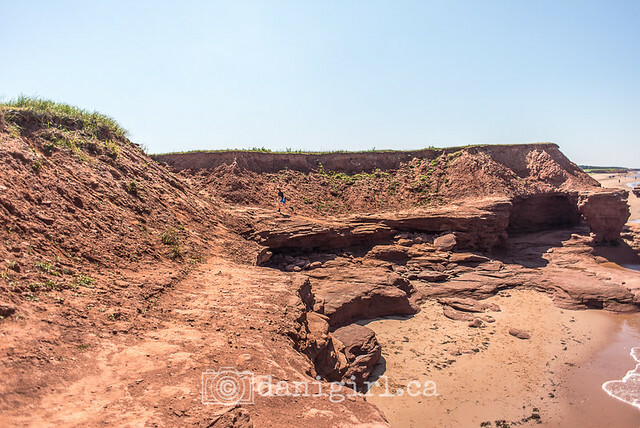 It’s also a lot easier to see the critters of the sea as the tide recedes and leaves little pools in the red sand where you can see crabs, tiny hermit crabs, mussels, snails and lots and lots of jellyfish. 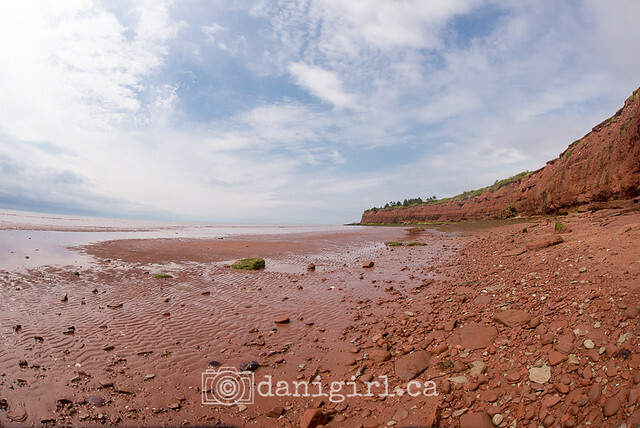 Argyle Shore is a provincial day use park, which means no admission fees but on-site (and clean!) bathrooms, picnic tables, a parking lot, and in this case, play structures. No Argyle socks, though. We looked! 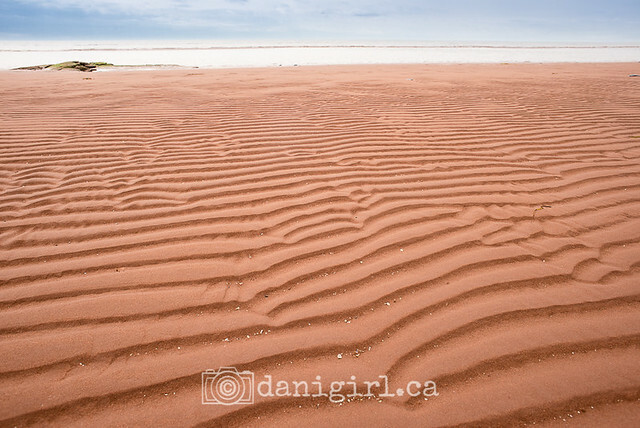 As you can see, in the height of tourist season it’s as madly crowded as the rest of the beaches. I continue to be astonished by the uncrowdedness of the place, even in peak season! 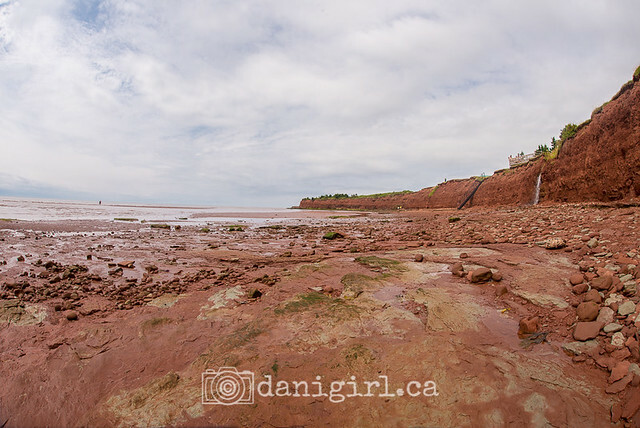 There’s a steep set of metal stairs embedded into the red cliffs to the rocky shore below. To your immediate left, a little spring-fed waterfall tumbles merrily down the cliff. You can see them both about mid-way along the cliff in this photo. 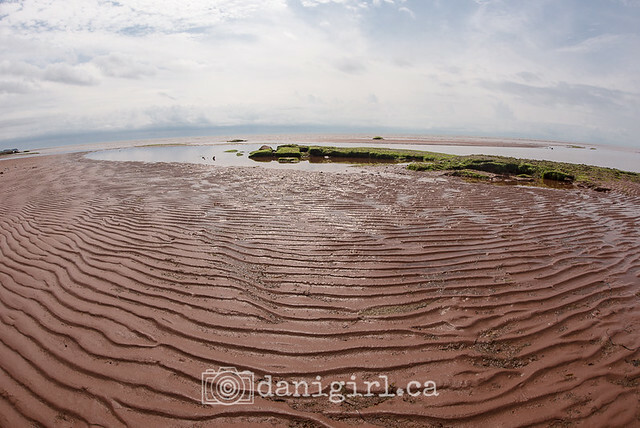 The rocks give way to sandbars with amazing ripple patterns from the waves. I was more fascinated by the ripples than by the critters in the tide pools! 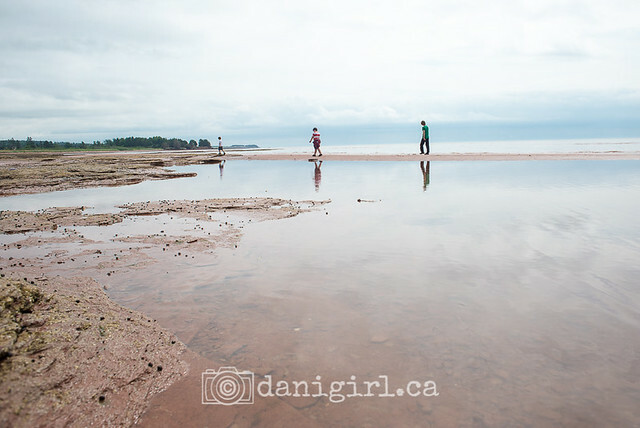 The tide pools did make for fun with reflections! The forecast had been calling for thunderstorms and rain in the afternoon but with a relatively clear morning. As we drove across the Island to the beach, it had been grey and rainy and we made resigned jokes about a redux of our rained-out visit to Victoria by the Sea, which is just down the coast from Argyle Shore. And yet, when we arrived, the heavy gloom lifted and we were treated to patches of blue sky, just in time for our picnic lunch on the shore. We are getting a LOT of mileage out of our picnic cooler this trip. It’s a great way to keep the expense of meals on the go under control and ensure the kids are only eating ONE serving of chicken fingers and fries each day. (Seriously, what IS it with kids’ menus at restaurants? Don’t get me started!) And there is something about food eaten outside in the fresh salty breeze that makes even the most humble sandwich a little more yummy. We’ve eaten ALMOST as much hummus and watermelon (not together!) as we have chicken fingers and french fries. Finger foods in ziploc boxes FTW! So the idea behind exploring the tide pools was a bit of a bust. I’d hoped to find starfish and sea cucumbers, which we didn’t, but we did see an astonishing number of snails and the ubiquitous jellyfish. We saw tiny hermit crabs (I thought they were bigger!) and I may have shrieked like a girl when a palm-sized crab scuttled too close to my feet in a tide pool, but the kids weren’t as into poking around in the tide pools as I would have expected. The fishy smell of seaweed and rotting jellyfish may have biased them, as well. It was still a fun adventure, but the boys didn’t get into it as much as I’d thought they might. 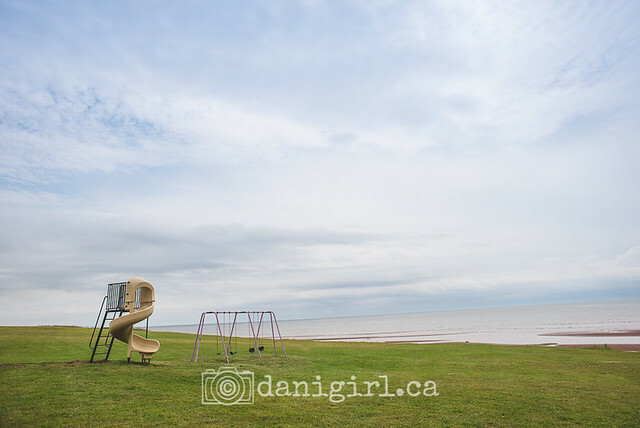 Last year, we drove past Sandspit Amusement Park on our way home from Green Gables and Cavendish. Lucas saw it, begged to go and and being more than a little tired, cried fat tears of dismay when we said no. We did promise him we’d go during the trip we were already anticipating for this year, and he never forgot about it through the year. To be honest, I was not really looking forward to it – but the boys certainly were. And then the forecast never really cooperated with a definitive clear day. Who wants to visit an amusement park in the rain? With two days of thunderstorms in the forecast, we finally gave in on Monday despite the forecast for cool temperatures and intermittent rain. We LOVED it. All five of us loved it, and to be honest, it was worth every penny. It’s just a tiny little park – it reminds me of the kiddie section of Canada’s Wonderland. We went almost all of the rides at least once, and many of them several times. The Cyclone is an zippy little roller coaster with a killer hard stop at the end, but the discovery of the day for me was bumper boats. Growing up, I used to see television commercials for the bumper boats at Ontario Place and have always wanted to try them. 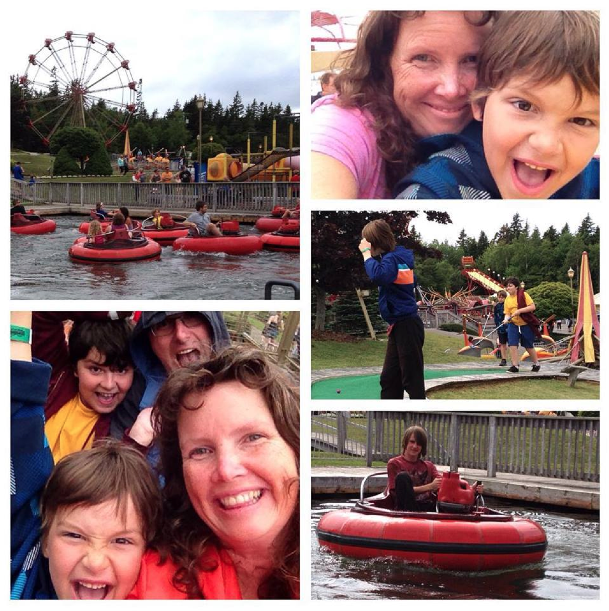 I could have seriously spent five hours just riding the bumper boats over and over – except my arms and wrists might still be vibrating from the motors! And if you visit on a drizzly day, you won’t have to wait more than five or ten minutes in line for even the most popular rides. I was quite won-over by this sweet little park and there’s definitely a return visit in our future.